I’m not sure why the Criterion print of Tampopo turned up in the Leeds festival programme but I’m glad it did because I missed it back in the 1980s. I think I probably got more from it now than I would have done then. The film opens with an extended gag about audience etiquette in the cinema featuring a dashing gangster (Koji Yakusho) in his white suit accompanied by his moll. The gangster sits on the front row and threatens the rest of the audience not to talk or eat crackly snacks during the film. The opening gag is a marker for the unconventional narrative that unfolds in which the central story is ‘interrupted’ (but all in quite smooth transitions) by several unconnected vignettes – two more of which feature the gangster. The main narrative is associated with the Japanese passion for ramen – noodles. Two truckers operating a milk tanker return to their home city in a rainstorm and decide to drop into a run-down noodle bar. The noodles aren’t great but the driver Gorô (Yamazaki Tsutomu) falls for the widow running the joint and determines to help her make it the best ramen bar in the city. Ken Watanabe in an early role plays the trucker’s co-driver Gun. The ‘task’ that the duo undertake will involve various escapades until the widow Tampopo (meaning ‘Dandelion’) played by Miyamoto Nobuko becomes the proud proprietor of the best establishment in town. It will, for instance, mean collecting together a band of helpers – almost like recruiting the samurai in Seven Samurai. In the meantime we revisit the gangster and enjoy other food and class conflict-related vignettes. In the process we learn a great deal about the Japanese obsession with how food is prepared and served. And we laugh at the differences in food culture entertainingly presented in a scene where a Japanese tutor attempts to teach her students how to eat spaghetti without noisy slurping – which at that time was very acceptable when eating noodles in Japan (I’m not sure if it still is in Japan?). The film is quite rightly celebrated for its comedy, though I’m not sure it is as much of a masterpiece as its reputation suggests. Still, I don’t begrudge that reputation and the film is certainly loved by its supporters. Tampopo is an ’18’ in the UK, partly because of some entertaining eroticism as the gangster and his moll ‘exchange’ foodstuffs, licking them off each other while naked. More importantly, for animal lovers, a small turtle is killed and prepared to be eaten. 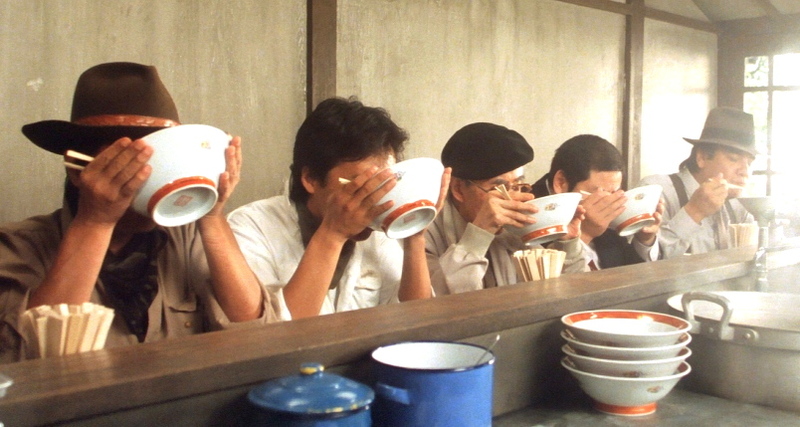 Tampopo is directed by Itami Jûzô and photographed by Tamura Masaki who executes a much discussed final shot with a beautifully-arranged zoom to show the most natural form of human food consumption imaginable. It’s a very enjoyable film and reminds me that I haven’t seen enough Japanese cinema from the 1980s (and 1970s). Many commentators have made the link to Italian Westerns, partly because of the cowboy hat Gorô wears plus the music and other elements. The film is available in the UK on DVD and Blu-ray.